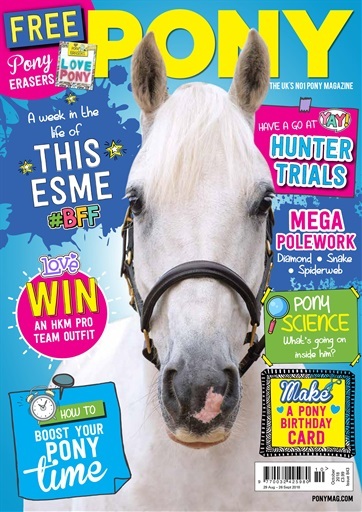 October PONY is here and it’s full of brilliant training and horsecare tips, plus fun things to make and do. Add the wow factor to your schooling sessions by trying our amazing polework exercises – your fave pony will love them, too! Take a sneak peek at what’s involved in a hunter trial, learn how to ace leg-yield and find out how to keep your pony happy when he’s in his stable. You can also learn all about autumn laminitis and how to avoid it, and pick up some handy hints to make mucking out easier. 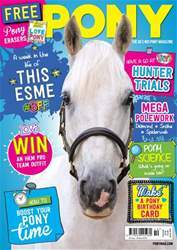 There’s also a fab pony birthday card you can make, and a brilliant photostory to enjoy! Also, don’t miss our epic competition to win HKM Pro Team clothing for you and a headcollar for your fave pony.